Dallas – Located in the midst of Uptown Dallas, Crooked Tree Coffeehouse is surrounded by such popular haunts as the Common Table and Company Café. Alpha gives Crooked Tree Coffeehouse two thumbs up for the added touch of serving sparkling water alongside its tasty espresso! For a funky place to have a meeting, a change of scenery to catch up on email, or a “quick” game of Risk, we recommend this café to anyone looking for some caffeine in Uptown! 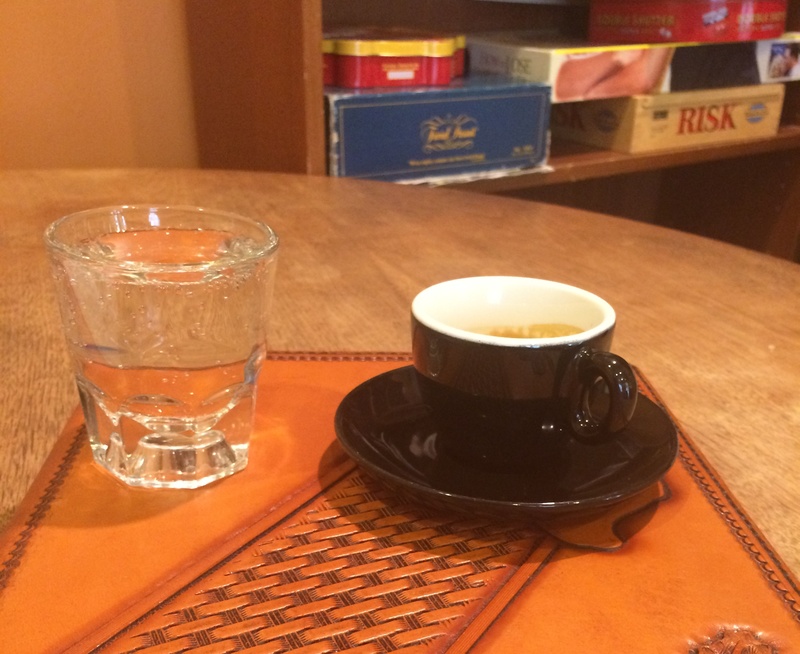 SAN ANTONIO — Looking for a good coffee shop in San Antonio? Top rated in the city according to the San Antonio Current and with a 91% rating on Urban Spoon, Local Coffee San Antonio might be the place for you. You can visit them near downtown in Alamo Heights, at the newly revitalized Pearl Brewery, or in Stone Oak if you’re on the north side of town. 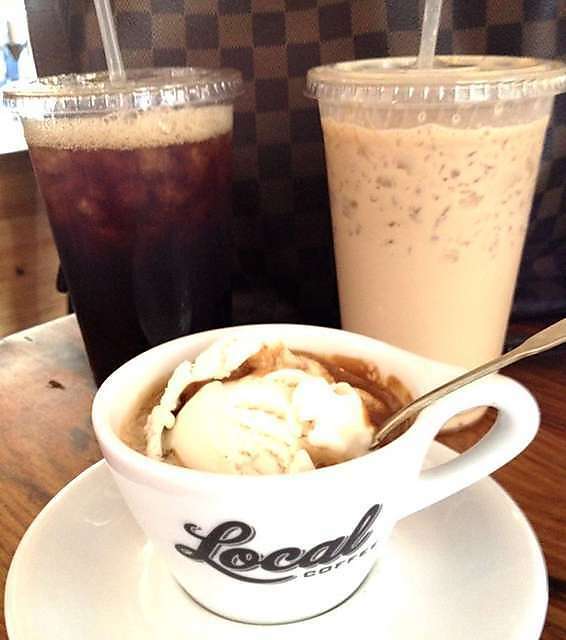 Local Coffee is a great place for coffee lovers to beat the summer heat, with well-rated iced coffee treats. Check out this beauty—is that ice cream in your coffee? Next time you’re looking for a great cup of coffee in San Antonio, drop by Local Coffee and let your Alpha family know if it lives up to its reputation! We’re always looking for great places to try as we travel around Texas. 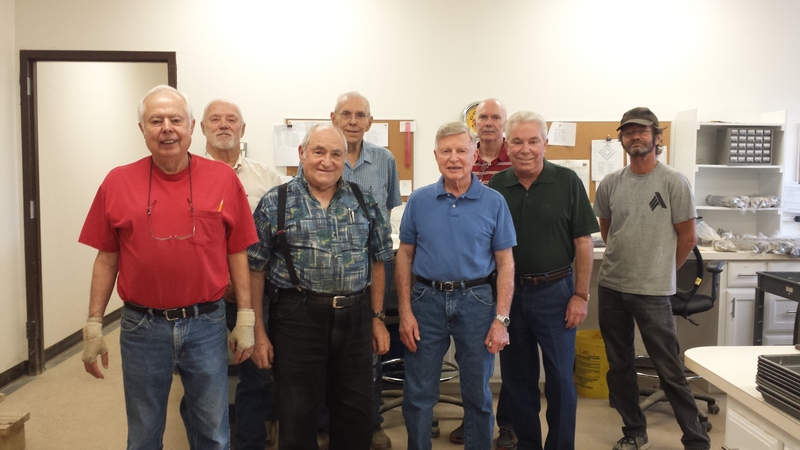 The geo lab technicians have nicknamed themselves the A Team: A for Ancient (their words!). And the fun nicknames don’t stop there if you wander back to the lab. Juan Grande, New Dale AKA Young Dale (as opposed to Old Dale, AKA Dale Dale), el Hombre con Lápices Pequeños–a newcomer has a lot to learn when encountering this group! To perform tests required by the engineers up front, the A Team must cut, chop, grind, soak, measure, roll, bake, sieve, and yes, even microwave soil samples. But don’t worry, the A Team doesn’t work too hard. They adhere to a steady schedule: 7:00 AM arrive, 9:30 AM break time, 11:00 AM lunch, and home by 4:00 PM! Most summers, an intern or two ends up working in the lab, too. Past interns have left their marks, with practical jokes still cropping up in the computer programs developed by the tech-savvy youngsters (for example, no matter how good the results are on your Atterberg limits, the commentary always tells you to go see Tony!). Interns learn the ropes under the guidance of the A Team, including navigating the complicated shelving system for the “Library” of soil samples (do these go on shelf B, BB, B1, B2, B3, or B4? Why is B5 around the corner in the back? ), and how to get the exact consistency of mud needed for a good PI test (peanut butter, or maybe cake frosting). With plenty of experience and an eye for perfection, the geo lab technicians know how to have fun while keeping up with a steady workload. These tests provide the data for engineers to make suggestions regarding construction practices, the very heart of what our geotech department does. You may have seen some of our really amazing projects recently on Facebook, or maybe you’ve read up on the ways that Alpha team members are being recognized for their outstanding work and helping their communities. But have you heard about Alpha’s ongoing commitment to mentoring upcoming engineering students? 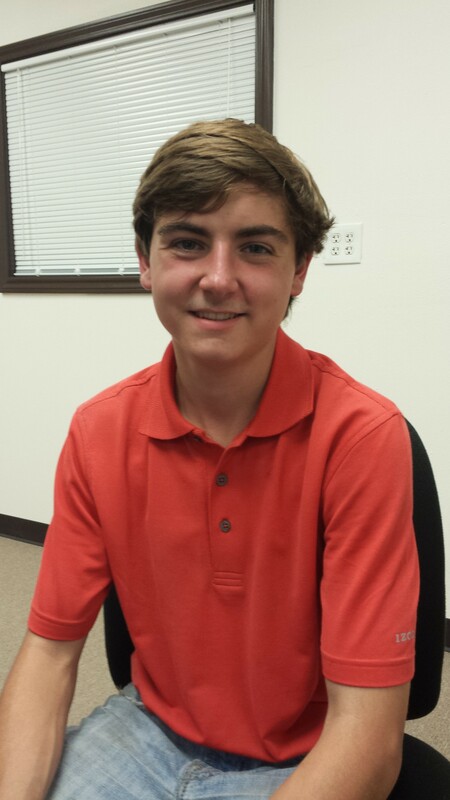 This summer, the Dallas office has two engineering interns working in the geotechnical department. 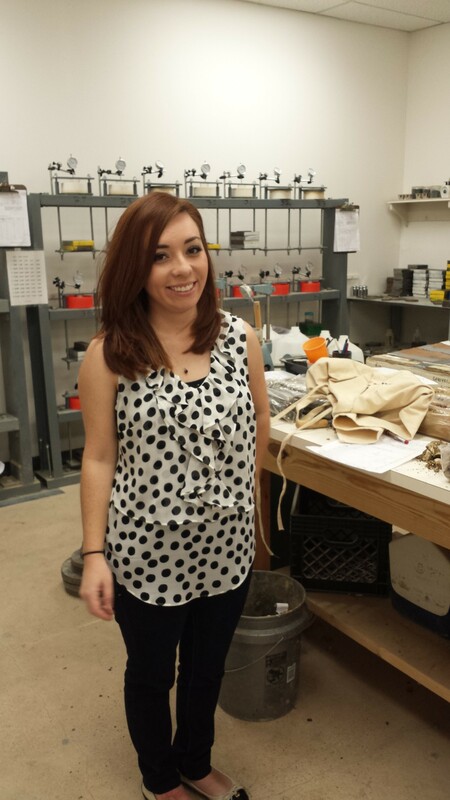 Sarah Garduño is a recent graduate of New Mexico State University, where she received her Bachelor’s degree in Civil Engineering. Come fall, she’ll begin pursuing her Master’s degree, also at NMSU. Sarah is a member of the ASCE Engineers Without Borders, a “nonprofit humanitarian organization established to support community-driven development programs worldwide” (EWB-USA 2014). She has a passion for engineering and the construction industry, passed down to her from her father. Besides engineering, Sarah loves the great outdoors, and kayaks at Lake Grapevine. 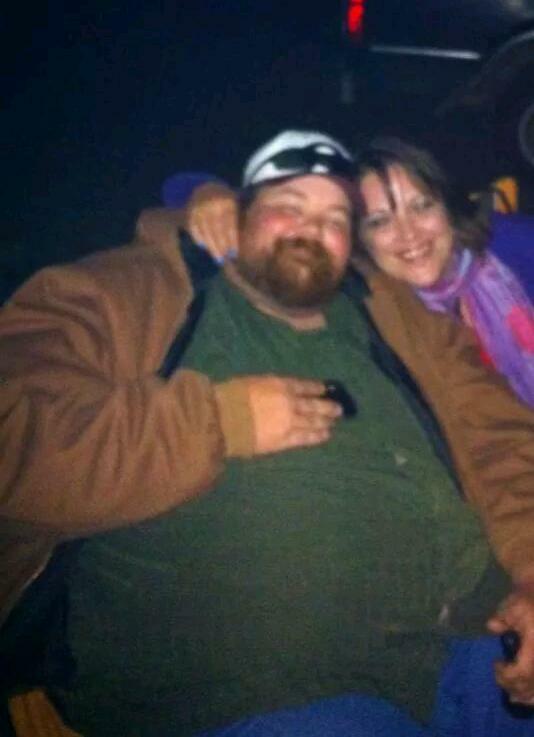 James Darling is an industrial engineering student at Oklahoma State University. A National Merit finalist, James is working alongside his Alpha mentor Blain Lehman. His work at Alpha includes preparing drilling site plans, staking drill sites, and handling drill tests. When not getting up close and personal with the muddier side of Alpha’s work, James reads and pursues his interest in philosophy. He is also percussively talented and plays the snare drum on the OSU Drumline. Do you know any promising engineering students looking for a great opportunity for in-depth, hands-on experience in Dallas, Fort Worth, Houston, or San Antonio? Tell them to contact Jeff Wilt. SAN ANTONIO — The results are in! 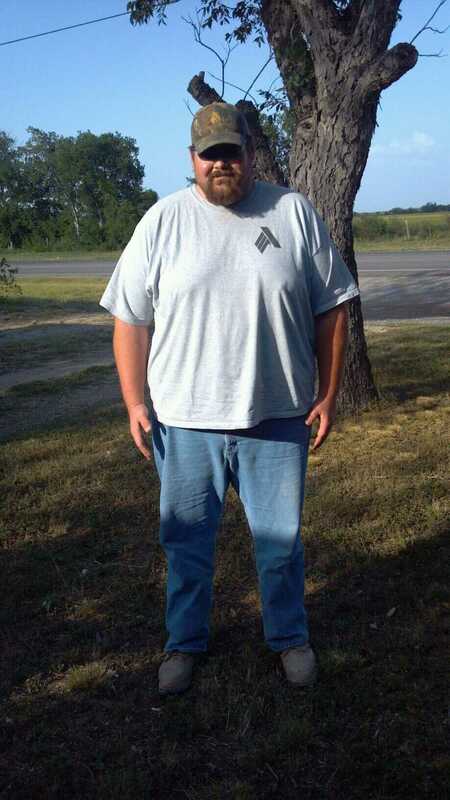 San Antonio Alpha employees competed in the company’s first ever Biggest Loser contest, and WOW! We are pleased to announce this year’s winner, Steven Brucks. 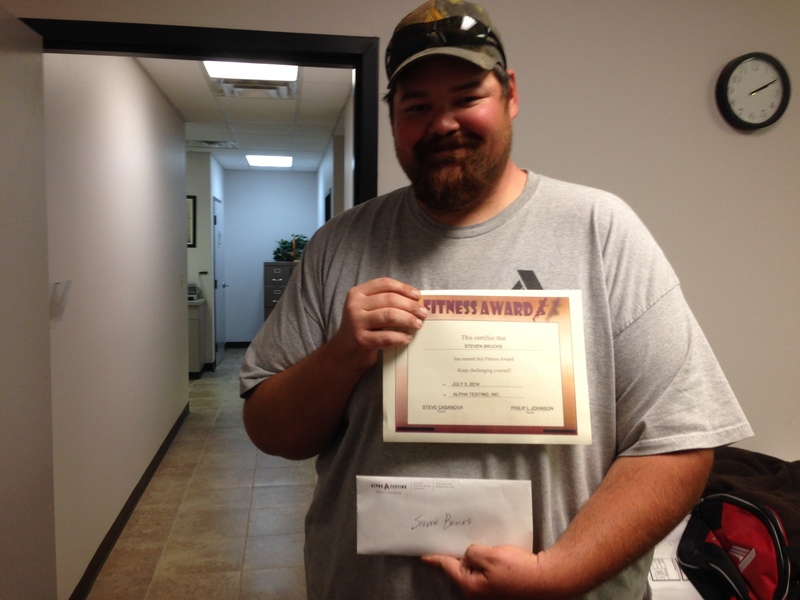 Steven has been a technician with Alpha for almost three years, and is the San Antonio office’s Safety Coordinator–hence the nickname “Safety Steve.” After six months, Steven lost an astounding 96.5 pounds–that’s about sixteen pounds per month on average! Great work, Steven! What an inspiring accomplishment! Will you be Alpha’s next biggest loser? Make sure to keep up with our fitness events and initiatives happening at all of our offices, like the Form Follows Function 5k in Dallas. Here it is, the third installment in the four-part series recognizing the 2013 recipients of the annual Where It All Begins Awards (see Fort Worth’s recipient here, and San Antonio’s here)! Stay tuned for the fourth and final installment, coming in the 4th Quarter 2014! We love to recognize our employees for their commitment to the Alpha Way—First in Service to our clients, co-workers, and the community! The winner of the 2013 Founders’ Award, Houston’s version of the Where It All Begins Award, Victor Barron, proudly exemplifies this commitment. Victor goes the extra mile to support the Alpha family on the job and in the field. We are proud to acknowledge his hard work and dedication with the annual award, as a token of our thanks to this outstanding employee. 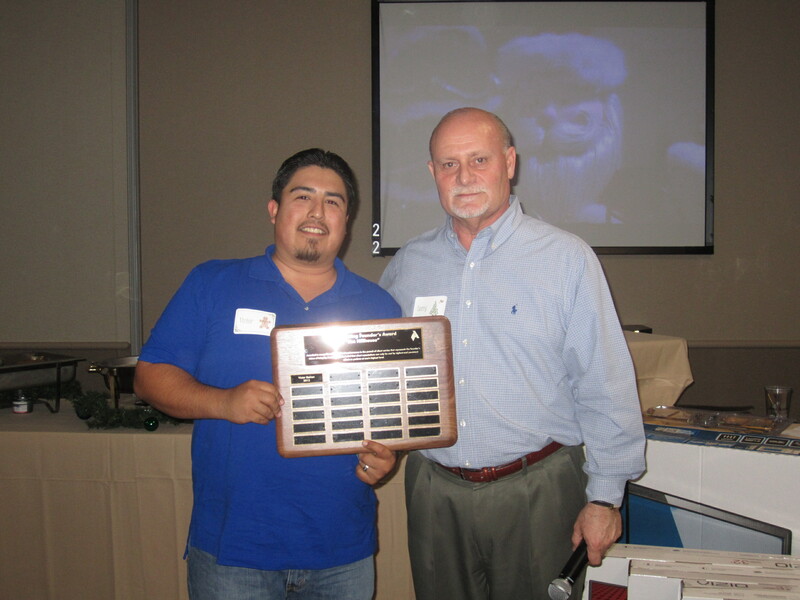 Victor Barron accepts the 2013 Founders’ Award at our Houston office. Victor began working at Alpha just over a year ago, but Alpha is just one part of his life. When not on the job, Victor likes to beat the Texas heat at the lake, the beach, and the pool. But he might not have much time for the life aquatic this summer—we at Alpha want to join Victor and his wife Jessica in welcoming their first son, Damian Joseph, born May 21st! Congratulations, Victor and Jessica!